The perfect place to get your message across to the ever-expanding Charleston Craft Beer Community. We believe in the Charleston beer scene. It’s growing so fast that locals, let alone tourists and Charleston visitors, have a difficult time keeping up with brewery openings, specialties, locations, and the finer points of choosing between them. The Charleston Ale Trail is going to solve this problem. Our comprehensive guide will include all breweries now open (or opening within the next six months) and will locate each brewery within a subset of Charleston (downtown, Mt. Pleasant, North Charleston, West Ashley, James and John Islands). Our print guide will include maps to guide people from one location to the next, while our mobile friendly website will actually calculate the shortest routes and give directions from one brewery to the next! Add to that advertisements for beer shops and craft beer friendly restaurants (running side by side with their closest breweries), and you have everything you need to explore the Charleston area craft beer scene. 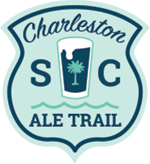 The Charleston Ale Trail is an expansion of Ale Trails of America, which was founded in 2012 in Asheville, North Carolina. The Asheville publication began as an online guide to everything beer in the Asheville area, and grew to include a print version of their guide in 2014. The first year that we put out the Field Guide magazine in Asheville we printed only 25,000 copies for each bi-annual edition. It was an incredible success! We’ve had to increase the print runs annually to make sure that we have enough to distribute for the six-month program runs. The Charleston Ale Trail has grown by 5,000 print copies per edition, with 35,000 copies of the Spring / Summer 2018 edition in circulation and an expected 40,000 copies in print for the Fall / Winter 2018 edition.